Well here it is August, I have not really been very successful on my once a week posting or even once a month posting. Due to the weather conditions, please note that there will be no school today, April 2, as per the Supreme Education Council directives. Please note that the HR office will be open between 6:45am and 8:00am to hand in the exit permits. If you have any concern, please do not hesitate to contact me. I take this opportunity to wish you all a well-deserved spring break. I immediately thought I must be mistaken, and woke Rob to ensure I was reading my email correctly, I WAS! Happy early spring break Doha. Once the light of day broke, this is what could be seen from our window. Super #sandy #qatar school is closed! So I got the coffee brewing, finished the packing for our upcoming Spanish adventures and then completed Day 170 of mandala making. and read through it and then saw this in the Participant spotlight! Below is an excerpt from the blog, thank you Kathryn! Each week we feature one of the participants from the 100 Mandalas Community. This week I am delighted to introduce you to a friend of mine, Kelli Capone Cody who was the first person to reach 100 mandalas in 100 days. This is really significant as Kelli was the art teacher 17 years ago who introduced me to mandalas and the work of Carl Jung. We were both in our first year teaching at Kearsarge Regional High School in New Hampshire. Kelli told me how in art school one of her teachers assigned to them a daily mandala and journal assignment. Kelli gave me some tips on facilitating a group mandala experience and my first mandala was facilitating a collaborative mandala with my 17 graphic design students. So truly honored and humbled, thank you again for inviting me to the challenge. Peace. Day 100 of the 100mandalas challenge! 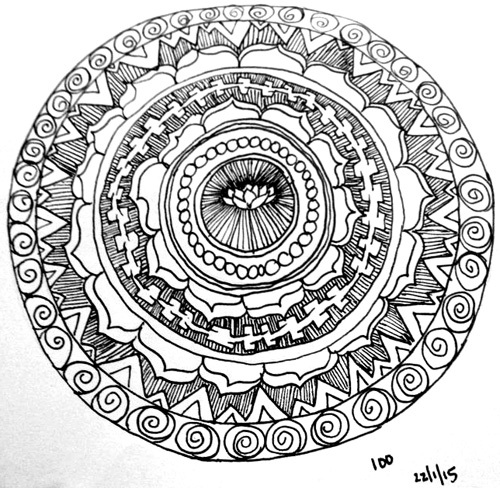 Well the day has arrived, yesterday was the 100th day of the 100Mandalas Challenge for me. 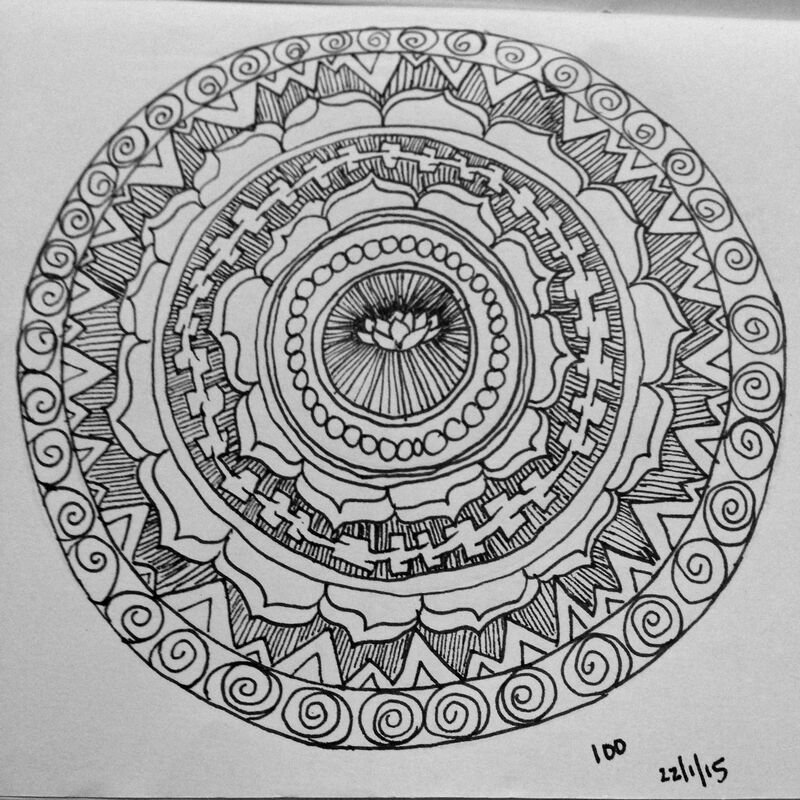 As I shared Day98s mandala, a friend added a comment asking would I extend the challenge to 365?!? 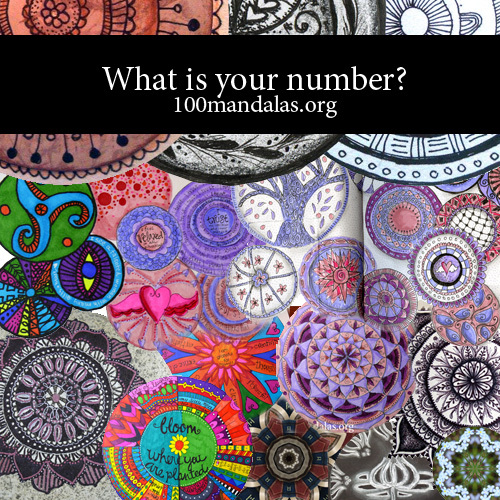 Then the challenge creator asked a similar question on their site, “What’s your number?” a little check in as we approach the 100th mandala what will we do: continue our mandala practice? Or go for 200? I replied that I was working on my 100th at that moment and who knows maybe I’ll go on towards 365 just like my friend suggested. Just incase you missed it here is the challenge information as started by a former colleague of mine from when we worked together in New Hampshire, thanks again Kathryn for the inspiration. Here is also a quick peek into my journal, a gift from another former colleague Ruth, when we left Phnom Penh. Ruth was also sitting besides me when I first started this blog to gather my sporadic squiggles… Thanks to you Ruth for the inspirational blank pages. As I posted my mandala for day 87, I am realizing how much I am enjoying the process of the 100 mandala challenge. I know it was to create 100 mandalas, I added the challenge of 100 consecutive days to keep me on task. There were a few days over the holiday break over December and January where I skipped a day and caught up the next or maybe I skipped a few days and then caught up for those to get back on target for the 100 days. It has been a while since I have focused my art making on the mandala; though it is a theme, image, approach I have returned to often since first discovering them while I was studying art therapy at Hofstra University (many years ago). I had forgotten the inner focus that they draw from, the release of emotion that they provide and the recharging of my creative energies. My art making recently has been quick journal entires or examples for my art units (I teach art to primary students by day) and I had not realized how I have missed being creative. I have found a few apps or sites that have been fun to play with like Paper53 app, http://nathanfriend.io/inspirograph/ and Kaleidoscope app to mix things up during the challenge. Really most of my mandalas have been in my journal (one a friend gave me when we were leaving Phnom Penh). Here is a link to “My 100” Pinterest Board this is where I have been posting the mandalas as they are made. There is also the “100 Mandala Challenge” board on Pinterest or use the hashtag #100mandalas or #100_mandalas on Instagram or Twitter to find others who have been participating in the challenge. Enjoy and feel free to share your thoughts on my 100 mandalas. 100 Mandalas in 100 days! Yup that is right, I said it: 100 mandalas in 100 days. I know what you are thinking, how does one keep up with that, why does one keep up with that? Well a former colleague of mine from a time when we were both teaching at a HS together in New Hampshire started this challenge. Kathryn Costa at True North Arts mentioned me and all those years ago in another time and place how I introduced her to mandalas! You never really know when you will do something that changes or influences a person. Kathryn had made me a better person and teacher all those years ago by being a colleague who made me think about my lessons, what I hoped the students would get from them and I still think of some of the art we made together and with other teachers I worked with at that time. So Kathryn and her mandala partner started this challenge to create 100 mandalas and I jumped right in. At first I was worried how will I go about sitting down each day to complete my mandalas. Now at day 60!, I look forward to the little window of working on my mandala to refocus me, to de-stress, to settle into the space around me and just draw for a few minutes or a few hours depending on how it goes on that day. Most of my mandalas have been created in a brief session, I am working full time, have 2 “teenagers” (one turns 14 in less than a week and the other is 12), just completed a master’s class on holistic learning, and the end of the trimester is upon us… not much going on at all. Want to see some more check out the 100 Mandalas on instagram #100mandalas or #100_mandalas or on pinterest! It has been busy- we moved, new jobs for both my husband and I, new school for the children and a 100 mandala challenge! I will post what doodles and squiggles have been in the works!